Intel are without a doubt the most popular processor manufacturer in the world and their 8th gen CPUs offer great performance and feature a wide range of performance levels from their Pentium range all the way through to the high-performing quad core Core i7. We also have a selection of 9th generations CPUs available. PLEASE NOTE that only the Z390 motherboard selectable in the configurator below is compatible with the 9th gen CPU. We have a selection of motherboards available from ASUS and Gigabyte. Each motherboard offers something different. The ASUS B360-I is ideal for customers looking for good solid performance without the use of RAID. While the Gigabyte Z390I-AORUS offers everything the previous motherboard does but with the added benefit of RAID support plus it features a HDMI 2.0 port, allowing it to connect to a 4K display while running at 60Hz. This is ideal if you intend to use your system as a media player and want the best possible resolution. It is possible to purchase this bundle without a CPU cooler preinstalled. This is for customers who plan to use this bundle in a fanless chassis, like those available from Streacom. This is because these type of chassis include an integrated CPU cooler as part of its design. 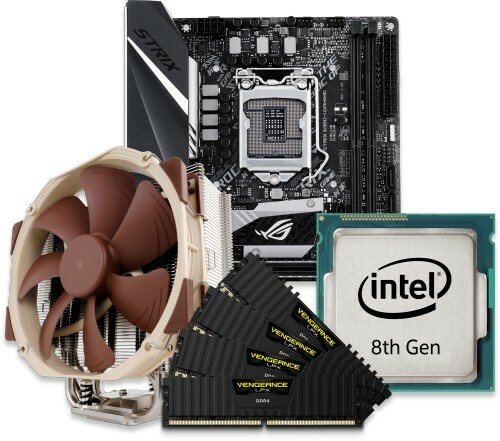 If you decide to purchase this bundle without a CPU cooler we will still perform all tests with a temporary CPU cooler installed. 3.7GHz Intel 9th Gen Core i5 9600K 6C/6T 95W 9MB CPU (Z390 only) ? 3.6GHz Intel 9th Gen Core i7 9700K 8C/8T 95W 12MB CPU (Z390 only) ? 3.6GHz Intel 9th Gen Core i9 9900K 8C/16T 95W 16MB CPU (Z390 only) ? Noctua NH-L9x65 65mm Low Profile CPU Cooler ?